What better way to celebrate Halloween than to make your own scary halloween props, such as a spooky headless packing tape body cast. Typically done with just clear packing tape, we spiced it up a bit by adding black lace and pink damask TapeSwell decorative packing tape. Body casting is fun, easy and a great craft to do with kids, just make sure they snacked before you start. 1. Start with a willing subject (thank you Lia!) and saran wrap. It is best to have two people to do the wrapping, extra sets of hands really help with the unruly nature of plastic wrap and tape. 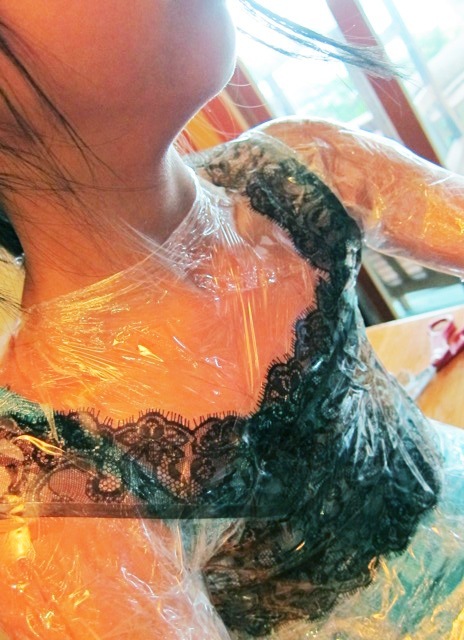 Try to wrap the sheets of saran wrap as smoothly as possible around your subject. It took two of us about 20 minutes to wrap Lia from head to toe. If you don't have time to do a whole body a leg or an arm works too. 2. Make sure to cover your subject fully in saran wrap. Any exposed skin will results in a serious ouchy moment when you get to the taping part. 3. Use clear packing tape and cover your subject completely in small strips. Its best to have several lengths of tape cut and ready to go. Make sure not to wrap the tape too tightly around your subject. We used less than a roll of tape on Lia. Use TapeSwell black lace tape to accent the neckline and create a bodice and skirt. 4. Carefully, and I mean carefully, cut the cast off your subject. Try to cut from under the arms, legs and from the back. Once the cast is fully removed start from the legs and work your way up, patching up cuts with small pieces of the clear packing tape. The cast will look a bit floppy but fear not, when finished patching she will be as good as new. You can use your hand to smooth the form from the inside helping to keep the shape of the body sculpture smooth and intact. 5. 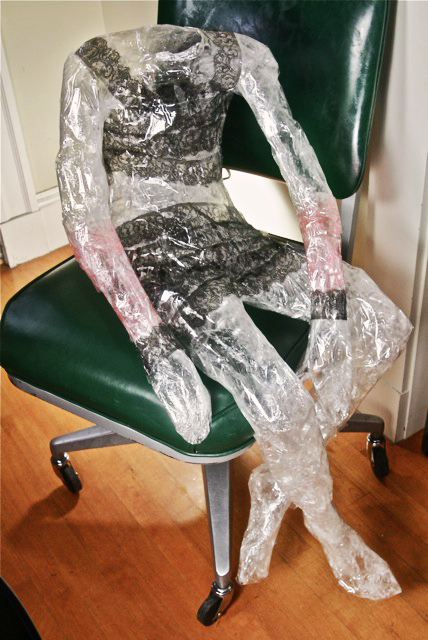 Completed tape body cast of Lia, ready to frighten all tricker treaters that dare to knock on our door.